I like to get out and go for a walk just about every day. And ever since I bought an iPod Touch, I have really enjoyed listening to various sermon podcasts when I do. As a church techie, I don't often get to really listen to a sermon; normally I'm busy tweaking other things and can't focus much on it. So the opportunity to hear 6-7 sermons (or perhaps a geeky podcast like TWiT) has been great. Most of the time, anyway. The other day I was listening to a well-known pastor's podcast (you would instantly recognize his name). I have got to tell you, though the message was great, the audio was not. I could tell the originally recorded audio was rather marginal, and the MP3 encoding was done at such a low bitrate that the artifacts were very distracting. As a long-time audio geek with a great desire for quality audio, I thought I would share the process we use to put together a really good sounding podcast. This week we'll touch on recording; next week post-production; and in two weeks, I'll share my encoding secret sauce. In case you haven't picked up on the new format for the blog, Monday's are now Audio days. The first step in getting a quality podcast is to get a quality recording. This involves several components, not the least of which is the choice of microphone. We use a DPA 4088 cardioid headset microphone. I'll warn you, it's not cheap. It is, however, the best sounding headset mic I've ever heard. The Countryman e6 is another popular choice, as is the AT 892. Personally, I like the sound of the 892 better than the e6, though some complain it's harder to fit. What you don't want is an omni-lav. It's not that an omni lavaliere can't sound good--the Countryman B3, Tram TR-50, Sony ECM 77 and other sound fantastic--it's that when used in a live PA setting, they tend to pick up too much room noise. So you hear the preacher's voice, then you hear the echo from the PA. All this extraneous sound wreaks havoc on the low-bitrate encoder and leads to annoying artifacts. If at all possible, stick with a good headworn mic, or in some cases a handheld (providing it's used properly). If you can, I recommend recording from a Pre-EQ direct out. The reason is this; you typically have to do a fair amount of EQ on even the best speaking mics to keep them from feeding back and sounding good. All that EQ will not benefit your recording. You can tweak the EQ later in post if you need to, but you can't put back what you previously took away. We don't currently do this because of the way our system is set up, and I'm not really happy with it. It was on my list of things to address, but I don't think I'll get to it. If you have to use a record out, or another Post-EQ send you can get away with it, but it's not optimal. The next step is a good recording. You can record straight to a computer, and that's what we did at Crosswinds. I bought a good sound card to use as an input source (don't use the 1/8" line in jack if you can avoid it--far too noisy), and recorded straight into Adobe Audition. USB and FireWire interfaces are also excellent (and more flexible) options. Recording to a CD-R is a possibility, though I would recommend doing some post-production on it. I really like solid-state recorders. 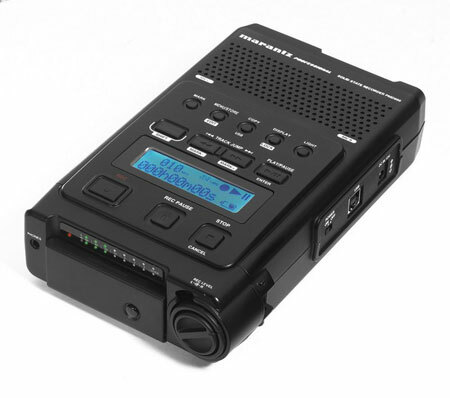 We have a Marantz PMD660 that records to Compact Flash. With a 1 Gig flash card in it, we get several hours of record time. While it will record to an uncompressed WAV file, I've found the high-bitrate MP3 option sounds just fine. I record at 44.1 KHz since my podcast will end up at 22050 Hz and getting there from 44.1 requires less rounding (as compared to a 48 KHz recording), and theoretically anyway, fewer artifacts. The Marantz PMD 600. A great little digital recorder.We used to record to an Alesis HD24, which sounded great but was a pain to use because files were transferred via a slow, 10 Base-T ethernet connection. It took a good 20 minutes to pull down the 400 Meg file every week. Using USB 2.0 on the Marantz, it takes 20 seconds. I like that. Please promise me you won't record to cassettes any longer. I'm on a mission to eliminate cassette audio distribution. I even told the few people who used to buy them at my previous church that I would buy them a CD player if they would switch. There are so many better options. Use them. So that's step one. Next week, we'll talk a little about post-production.